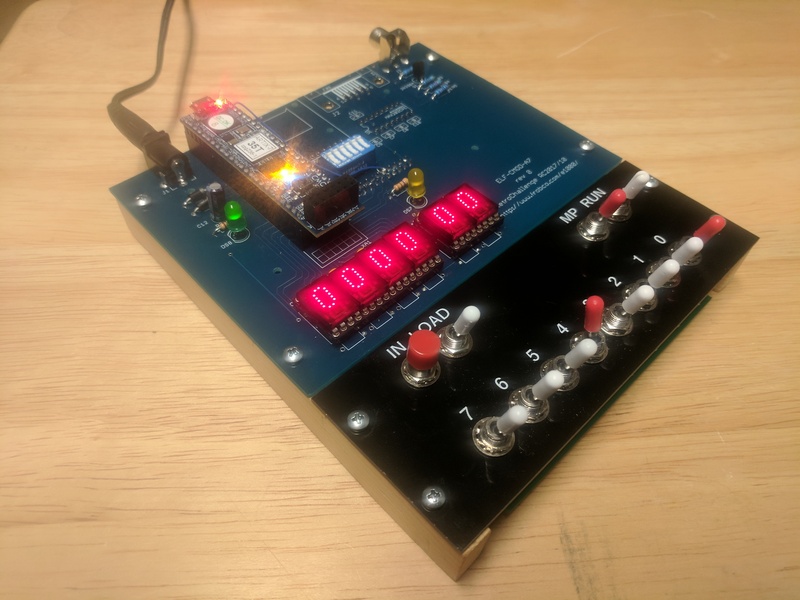 I’ve been curious about some details of how the Apple II emulation disk for the Apple III works, so I’ve been working on reverse-engineering the code. I’ve just put it up on github. The first 1 1/2 tracks of the disk get loaded into memory from A000..B7FF. That loads the Apple II ROM images into memory from 2000 up. Then it gives the user a chance to change some configuration options. Finally it copies the ROM images into place, does some more hardware configuration, sets the hardware Apple II emulation mode, and jumps into the Apple II monitor ROM. In addition to the internal floppy drive that came in my Apple III, and which does not work, I have three additional spare internal floppy drive mechanisms. Today I tried all of them, and found that none of them work well enough to boot an Apple III disk written from a disk image file by my Apple IIe. The disk format is identical to Apple Disk II 16-sector 5.25-inch format, and the Unidisk 5.25 drives I’m using on the Apple IIe haven’t had any trouble reading and writing any other disks from a large collection from various sources, so I’m pretty sure the drive on the Apple IIe is not the problem. Having four non-working drives made me think that perhaps the floppy controller, an integrated part of the Apple III motherboard, might be bad. I switched to my spare motherboard, and didn’t have any different results. I also have an external Disk III drive. I tried cabling that to the internal drive port, in place of the internal drive, and was able to successfully boot the Apple III Dealer Diagnostics disk. That mostly worked, and I was able to test the RAM and ROM of both motherboards. 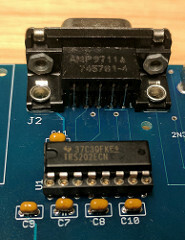 Both are the later 5V configuration, one with a 5V 256KB memory board, and one with a 5V 128KB memory board (which could easily be expanded to 256KB). I say “mostly worked” because the drive did give I/O errors trying to load some of the diagnostics, or to display a CATALOG of the diagnostic disk. So really, I have five Apple /// floppy drives that aren’t working properly. The floppy drive in my Apple III is not working well enough to boot floppies written on my Apple II. I think the spindle motor speed may be off. I’m hoping that’s what it is, since it’s the easiest thing to fix. I’m putting together a timing strobe light to measure it, using a microcontroller and an inexpensive Harbor Freight LED flashlight. I was looking at the schematics of Apple II and Apple III floppy disk drive analog boards on Bitsavers late last night, and made a surprising discovery: the DuoDisk 5.25 dual floppy drive sold for use on the Apple II is actually directly usable on the Apple III+, with the full functionality the Apple III SOS operating system expects. For the next RetroChallenge, I plan to port the Infocom ZIP intepreter to the Apple III, to run games (including Zork) natively under the SOS operating system. At the moment the floppy drive of my Apple III isn’t working properly, so I’ll have to fix that or replace it with one of my spares, though the spares aren’t necessarily in working order either. This evening I purchased a two-pack of inexpensive LED flashlights from Harbor Freight, and I plan to modify one, adding a PIC or AVR microcontroller, crystal, and NFET, to make a timing light for adjustment of motor speed. I hope that just adjusting the motor speed will be sufficient to get at least one of my floppy drives working; I don’t presently have a head alignment diskette. In the last few weeks, I retyped the source code, converted it to assemble with a modern cross-assembler, added back the conditionals for ZIP versions 1 and 2, and added the code for 3A and 3B. I’ve put it on Github. This source code will be used as the basis for the SOS port of the interpreter. The display output and keyboard input code will have to be replaced with code that uses the .CONSOLE driver, and the disk I/O code, both for “story file” and save file access will have to be replaced with code that uses the SOS file system calls, which are similar to the ProDOS file system calls used on the Apple II. 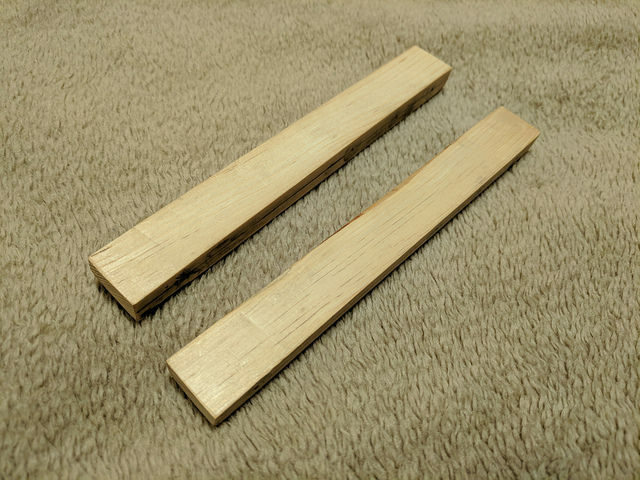 Richard Ottosen cut and drilled some mounting rails for me, out of some scrap wood. They’re standard Elf size, 3/8 inch wide by 3/4 inch tall by 6 inches deep, each with four 1/16 inch pilot holes for #4 wood screws. I’d vaguely considered the idea of nice stained hardwood rails, but that doesn’t really seem in fitting with the general COSMAC Elf idea. I haven’t actually mounted the boards on the rails yet, because I still need to cut and jump a few PCB traces. Once I put these babies on my Elf, she’ll corner like she’s on rails!